The L-rd spoke to me about a coming plague that will devastate the world. I prophesied many years ago that G-d will judge this world and we of this generation will see that happen. The L-rd spoke to me and said, "The Pale Horse has ridden," and then began to show me this coming plague. Prophets often do not know the timing of the things of G-d but only know they will appear as He has shown them. I would, however, suspect this plague to come within the next 5-7 years, maybe sooner, maybe later. Before it can come, G-d has to first warn His people about it and inform them of how to escape it. HEAR WHAT G-D IS NOW SAYING! When I first started in the ministry I wanted to understand the depths of the book of Revelation. The L-rd told me then that I was not to attempt to teach any of that book until He gave me direct revelation to it. Throughout the generations, man has tried to understand the mysteries of the book of Revelation. There have been many accounts as to what it means; so many, that confusion has long since taken over. I have always said that not all the accounts could be right. Until the L-rd gives us revelation, we don’t have but the part that has been given. Revelation knowledge comes as G-d deems it important enough that He wants that generation to move forward from where it is to where He is leading us. That is the reason why most miss what G-d is about to do because they don’t have spiritual ears to hear what He is saying. Everything G-d does is consistent with His Word. 1 And I saw when the Lamb opened one of the seals, and I heard, as it were the noise of thunder, one of the four beasts saying, Come and see. 2 And I saw, and behold a white horse: and he that sat on him had a bow; and a crown was given unto him: and he went forth conquering, and to conquer. The one sitting on this first horse has a bow and a crown. He goes forth conquering and to conquer. Many have thought this to have been the Lamb of G-d. However, this rider is not because of the scripture in Revelation 19.
Who Is the Rider In Revelation 6? This is Yeshua (Jesus), the Son of G-d. Notice that He has many crowns on His head and a sword that comes out of His mouth. If this is true (and it is), then who is this rider in Revelation 6? This rider is deception, and he has already ridden across the earth. The world and Church have been deceived. One of the first visions G-d gave me pertaining to the last days was a vision of a great serpent biting the Church. The L-rd said to me that deception had taken over the Church and many would remain deceived throughout the last and final move of G-d. That vision came in the late 1970’s. I did not understand what was involved in the vision; I only knew of the deception. As the years have passed, G-d has given me pieces to this vision, and now I do understand what He was showing me. The world will always be in deception. I don’t think that is any great revelation to anyone. But, few have realized that the Church has been deceived. We of the church all seem to know that the Jews have been deceived. Remember, being deceived means that we don’t realize the truth of the matter. If we did, then we would not be deceived. G-d is calling Ephraim home and the Church is for the most part Ephraim. You can find more on this subject by finding the article I did on the “Transition of the Church”. Ten years ago I prophesied what G-d had spoken to me, saying that this transition would go throughout the earth and would begin to stir Ephraim causing them to begin to come together. Since that time, the Messianic movement here in the United States has grown greatly. I have heard numbers of over 2 million. Neither the Church nor anyone else can or will hold back the will of G-d.
3 And when he had opened the second seal, I heard the second beast say, Come and see. 4 And there went out another horse that was red: and power was given to him that sat thereon to take peace from the earth, and that they should kill one another: and there was given unto him a great sword. In the year 1990, G-d took me in a vision and I saw a great sword of some 70 to 100 feet tall in a field. The sword was stuck in the ground at an angle. The L-rd spoke to me and said that He had taken peace from the earth and that the Red Horse had begun to ride across the earth. He said turmoil would come in every family and blood would flow throughout the world. Even in America we would see this happen. He said the only peace would be the peace of those who know Him. That would be a peace placed inside of us, but the world would no longer know peace. The peace that will soon come to Israel will be a false peace and it will fail. The sword always brings war, and there has been war among the nations. Genocide killing is now common in the world. Nations sit back and watch as hundreds of thousands are put to death. This is all part of peace leaving this earth. 5 And when he had opened the third seal, I heard the third beast say, Come and see. And I beheld, and lo a black horse; and he that sat on him had a pair of balances in his hand. 6 And I heard a voice in the midst of the four beasts say, A measure of wheat for a penny, and three measures of barley for a penny; and see thou hurt not the oil and the wine. During this time of the early 1990’s, the L-rd gave me another vision of how gasoline, fuel for heating our homes, food, drugs, homes, cars, trucks, and all other things pertaining to our living conditions would become far too expensive for many people to afford. Older people would have to make decisions as to whether they were going to eat, stay warm, or buy their medicines. This now is a very real trauma for thousands and thousands of our senior citizens. The L-rd told me that the time would come here in this country and around the world when people who could not be productive in our society would be put to death. Recently, we watched a woman being taken off of a feeding tube by order of the courts. This is just the beginning of what is about to take place. Our food supply is less and less as the population of this world keeps growing. The day will come when there will not be enough food, causing this to occur. What has happened thus far is only a shadow of things to come. We will grow accustomed to actions as the high courts have now dictated to us. In the end, we will accept the murdering of the people that are not productive in our society. Most of you reading this will live to see this take place. One of the judges of our Supreme Court said that the Constitution was old and was not appropriate for the people living today. He said it should be changed. G-d showed me that the Constitution would be changed because of the reasons that this judge gave. I prophesied this back in the early 1990’s. It is just a matter of time. It has been reported that our government has taken old military installations and made concentration camps out of them. This is presumed to be for the people of this country that might rise up to take this government back according to our constitutional rights. It was said that the Christian population was part of this group. I have no idea if this is true, I only heard the documentary. This is part of the turmoil that is going on even now, and it will grow worse. 8 And I looked, and behold a pale horse: and his name that sat on him was Death, and Hell followed with him. And power was given unto them over the fourth part of the earth, to kill with sword, and with hunger, and with death, and with the beasts of the earth. I prophesied at the time I received the vision about the AIDS epidemic and that there would come other plagues that would sweep the world with millions dying. This horse has been sent forth and will add to the sorrows of this earth. I realize that there have always been plagues that have crossed the earth, but this is different. In Matthew 24:8, we are told these are the beginning of sorrows. We have now entered into this place. One thing after another will happen until we will just think it is the way things are supposed to be. I prophesied recently that a plague is coming that will be a type of flu virus. This plague would quickly cover the earth and millions would die from it. I also saw by a vision that the overpopulation of birds and their droppings will cause devastating problems for our society. 6 And ye shall hear of wars and rumors of wars: see that ye be not troubled: for all these things must come to pass, but the end is not yet. Yeshua (Jesus) was foretelling the events of Revelation 3. He talked in verses 4 and 5 of deception and not letting any man deceive us. We have been deceived and not by the world but by those calling themselves Christians. We as Christians do not keep the Shabbat (Sabbath) of G-d. We keep a day different from that. We have been deceived in many areas, and G-d is now opening the eyes of all that have ears to hear what G-d is saying to the Church. We are living in verses 4-8 now. There have been wars and rumors of wars, nation against nation, and kingdom against kingdom. There have been famines, pestilences, and earthquakes in diverse places. Then, He says that these are just the beginning of sorrows. We are in for a long hard time until the L-rd Himself comes back to this earth. 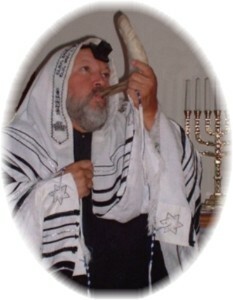 As a prophet of G-d, it is my duty to Him to blow the shofar (trumpet) and to warn the people of the coming judgments to this earth. As I said when the great tidal wave came to Indonesia, it is judgment coming from G-d. G-d was trying to say to us here on this earth to repent and return to Him. I now give you wisdom. G-d does not have two sets of people; He only has one people. G-d does not have two separate sets of rules, one for the Jews and the other for the Christians. G-d has one set of rules for His people. G-d is not two separate G-d’s, He is one G-d. 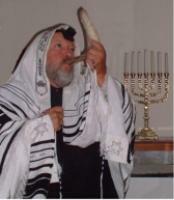 The G-d of the Old Testament and the G-d of the New Testament are not two separate G-d’s, He is one G-d. The Church never became the new covenant doing away with the old covenant. Nowhere does it proclaim in the scriptures that as the Church we were to forsake the Law. The new covenant was with the house of Israel and with the house of Judah that the Law would be written in their hearts. 34 And they shall teach no more every man his neighbor, and every man his brother, saying, Know the LORD: for they shall all know me, from the least of them unto the greatest of them, saith the LORD: for I will forgive their iniquity, and I will remember their sin no more. 36 If those ordinances depart from before me, saith the LORD, then the seed of Israel also shall cease from being a nation before me for ever. We are all His people if we have given ourselves to Him. One G-d, one people, and one set of rules for them all. As I said, we are in for a long hard time, and if we don’t get things put together we are not going to make it. There are numbers of scriptures to prove what the prophets are saying about the transition of the Church to be true. It marvels me to think the Church took a dream of a small girl, of a church going up into the sky, and created a doctrine of what we now know as the rapture. There are only three or four scriptures that even pertain to this doctrine. Yeshua (Jesus) said not to let any man deceive us. The biggest reason I have always felt the Church embraced this doctrine was because it was easier to sell that to the people rather than having to show the people how they were going to go through the tribulation. I have no problem of a catching away, but I definitely believe the Church will be here during the tribulation. If the rapture was to take place, it would mean that G-d takes the Church and leaves the Jews. That is not what is going to happen. What is going to happen is that as G-d’s children, we are about to enter into the miraculous. Many years ago G-d gave me a vision of the tribulation period. My family and I were sitting around a table that was set for eating. There was no food on the table. I began to pray and as we had our eyes closed food began to appear on the table. When I said, "Amen" and we opened our eyes, the table was full of food, enough for a feast. G-d spoke to me and said this is the way it will be during that time. The miraculous will become a way of life for those who are following Him. Brothers and sisters, we as the children of G-d are about to walk into the miraculous, as did the saints of old. Listen as I speak the heart of the Father. Just as G-d provided for the widow, He will provide for His own children. 9 Arise, get thee to Zarephath, which belongeth to Zidon, and dwell there: behold, I have commanded a widow woman there to sustain thee. 10 So he arose and went to Zarephath. And when he came to the gate of the city, behold, the widow woman was there gathering of sticks: and he called to her, and said, Fetch me, I pray thee, a little water in a vessel, that I may drink. 11 And as she was going to fetch it, he called to her, and said, Bring me, I pray thee, a morsel of bread in thine hand. 12 And she said, As the LORD thy God liveth, I have not a cake, but an handful of meal in a barrel, and a little oil in a cruse: and, behold, I am gathering two sticks, that I may go in and dress it for me and my son, that we may eat it, and die. 13 And Elijah said unto her, Fear not; go and do as thou hast said: but make me thereof a little cake first, and bring it unto me, and after make for thee and for thy son. 14 For thus saith the LORD God of Israel, The barrel of meal shall not waste, neither shall the cruse of oil fail, until the day that the LORD sendeth rain upon the earth. 15 And she went and did according to the saying of Elijah: and she, and he, and her house, did eat many days. 16 And the barrel of meal wasted not, neither did the cruse of oil fail, according to the word of the LORD, which he spake by Elijah. 17 And it came to pass after these things, that the son of the woman, the mistress of the house, fell sick; and his sickness was so sore, that there was no breath left in him. 18 And she said unto Elijah, What have I to do with thee, O thou man of God? art thou come unto me to call my sin to remembrance, and to slay my son? 19 And he said unto her, Give me thy son. And he took him out of her bosom, and carried him up into a loft, where he abode, and laid him upon his own bed. 20 And he cried unto the LORD, and said, O LORD my God, hast thou also brought evil upon the widow with whom I sojourn, by slaying her son? 21 And he stretched himself upon the child three times, and cried unto the LORD, and said, O LORD my God, I pray thee, let this child's soul come into him again. 22 And the LORD heard the voice of Elijah; and the soul of the child came into him again, and he revived. 23 And Elijah took the child, and brought him down out of the chamber into the house, and delivered him unto his mother: and Elijah said, See, thy son liveth. Who are His Children? Those that keep both the Law and confess Yeshua (Jesus) as Moshiach (Messiah). These are His children and He will do whatever is needed to protect them. I have said for many years that the Church of today is not the Church of our grandparents' day. We are responsible for things that they never knew about. Before we left Egypt, the L-rd told us to kill the lambs and place the blood on the lintels and doorposts of each home. That was so the death angel would pass over them, when he came to slay the first born. That worked just as we were instructed. We know that G-d sent His Son to do what the Law could not do: let us enter Heaven. He became the lamb sacrificed for us. He became the blood in the New Testament. Now the blood of the animal was no longer honored by G-d.
During World War II, the rabbis in the concentration camps told us that we needed to stand and watch G-d deliver us. Well, we all know that never happened. I can imagine during the time of Pesach (Passover) how they were so sure G-d would deliver them as He had so many times in the days of old. They were counting on the same blood that was applied in Egypt to work again; we all know it did not work for them. Because of their blinding they never knew that the blood covering of Yeshua (Jesus) had to now be applied. Somewhere around 6 million of us were slaughtered. The blood that Yeshua (Jesus) shed was our ticket to permit us to enter into Heaven. If the blood of Yeshua (Jesus) was enough in itself to protect us, then we as Christians would not have to worry about sickness or plague. The problem is His blood was not enough. Christians are sick and not protected as those who kept the Law were in the days before Yeshua (Jesus) came. They needed the blood of Yeshua (Jesus) and we today as Christians need the Law that they have. The proper application of the blood that the children of G-d need for these latter days is to keep the Commandments and have the covering of the blood of Yeshua (Jesus). That will let the plagues pass over you and yours. Then we will be able to proclaim the 91st Psalm as ours. The key is to find a prophet and listen to what he tells you and then do it. You need to find a seasoned prophet and not someone trying to be or hoping to be. You need to find a prophet with a track record that shows they are hearing from G-d. True prophets of G-d will tell you what is coming, how it will come, and what it will do. He that hath an ear, let him hear what the Spirit is saying to the church. 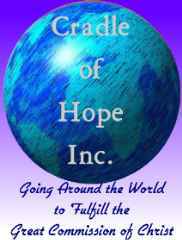 All material herein © 2004-2014 "Cradle of Hope"